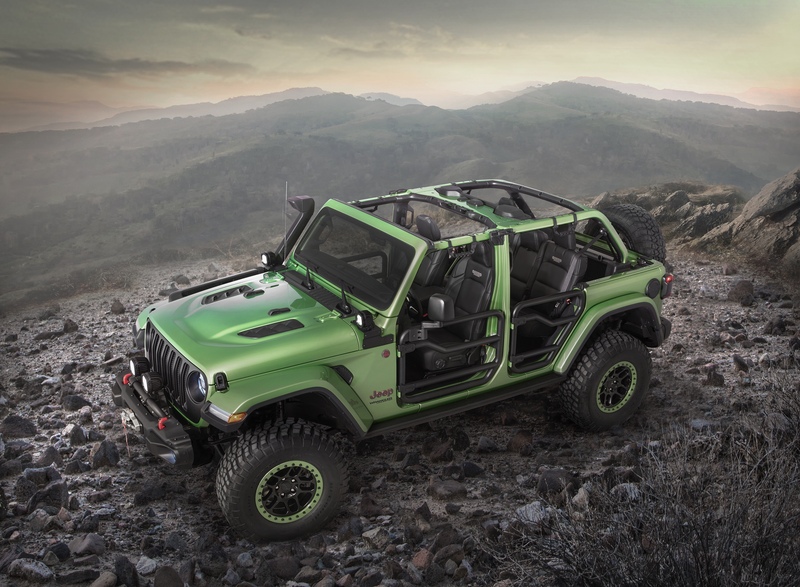 Jeep just revealed two teaser images of what are clearly JT Gladiator renderings. The first has a visible J6 badge on the side which clearly pays homage to the old J10 pickup truck. The truck will obviously feature many upcoming Mopar accessories for the Gladiator; including rock rails, wheels, and LED lighting. What’s hard to tell from the picture is if the roof mounted lights are above the rear seat… or if this is a bed mounted roll bar will auxiliary lighting. Maybe Jeep actually made a regular cab, long bed for EJS? The second teaser image is clearly a four door Gladiator with a crazy paint job. This truck also has what appears to be a bed mounted roll bar, bed rails… and of course a Mopar lift and mud tires. We’ll have to wait to see the rest of the group and of course real live images of the concepts.